In Japanese, the concept of "ikigai" can be defined as "a reason for being." 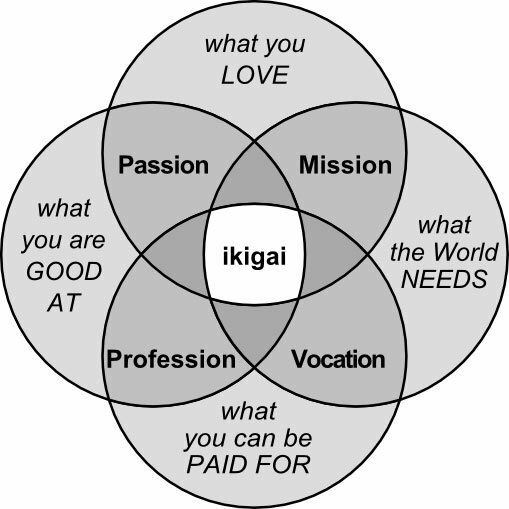 As illustrated by the diagram below, ikigai is achieved when it overlaps in these different areas. Similarly, we believe that when a person's personal AND professional ikigai align, it gives them the great opportunity for sustainable success. There is no singular blueprint for success and similarly, we recognize that definition of success also varies. The Ikigai Marketing consultation process is lengthy because it allows us to customize a roadmap based a client's individual needs and overall goals. We do not over-promise success to our clients without their hard work. We do, however, share our tools to help our clients find their own ikigai. We are the reliable vehicle with GPS and it is up to our clients to integrate the information we provide to get to their personal and professional destinations. We are not the main attraction - you are! We use our skills to help elevate those around us. Ready to move forward? Fantastic - we'll teach you how to fly.